The Winter Lights display in Gaithersburg is one of the holiday favorites in Montgomery County, Maryland. The drive-through light display at Seneca Creek State Park features 3 1/2 miles of Christmas-themed lights. Enjoy the following photos and get a glimpse of the annual event. Visitors will see many new surprises each year as the lights are designed to enchant the whole family. Look out for new animations as you drive through the park. 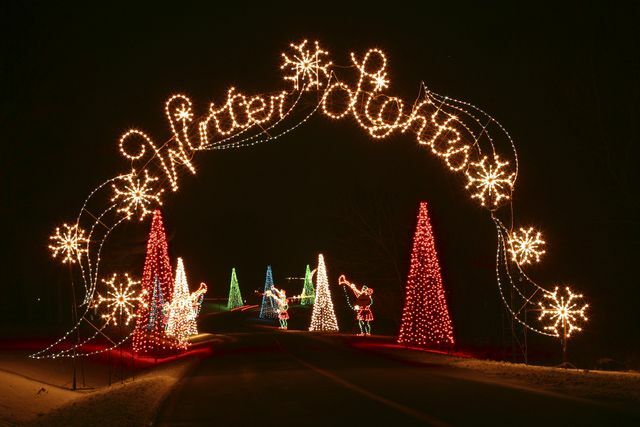 Drive through the Sparkling Tunnel and you will be marveled by the display of holiday lights. A reindeer welcomes visitors to the park to enjoy a festive holiday tour of lights. The elephant, bear and bunny area a happy group of figures along the driving tour of lights in Gaithersburg. Enjoy the Happy Holidays sign at the light display at Seneca Creek State Park. A beautiful peacock spreads its wings. Look out they may even change colors. Seneca Creek Lake is a unique destination for the holiday light display creating a perfect venue for water-related light decorations. Seneca Creek State Park is an ideal setting for the Christmas light display in Gaithersburg. Enjoy the 3 1/2 mile drive and turn on some holiday tunes on your car radio as you celebrate the season. The train station in lights is a favorite holiday decoration. The light display in Gaithersburg is one of many in the region. Enjoy the holidays and check out the schedule of Washington DC Area christmas light displays.